Corinth, Mississippi, so I did... and it was good. 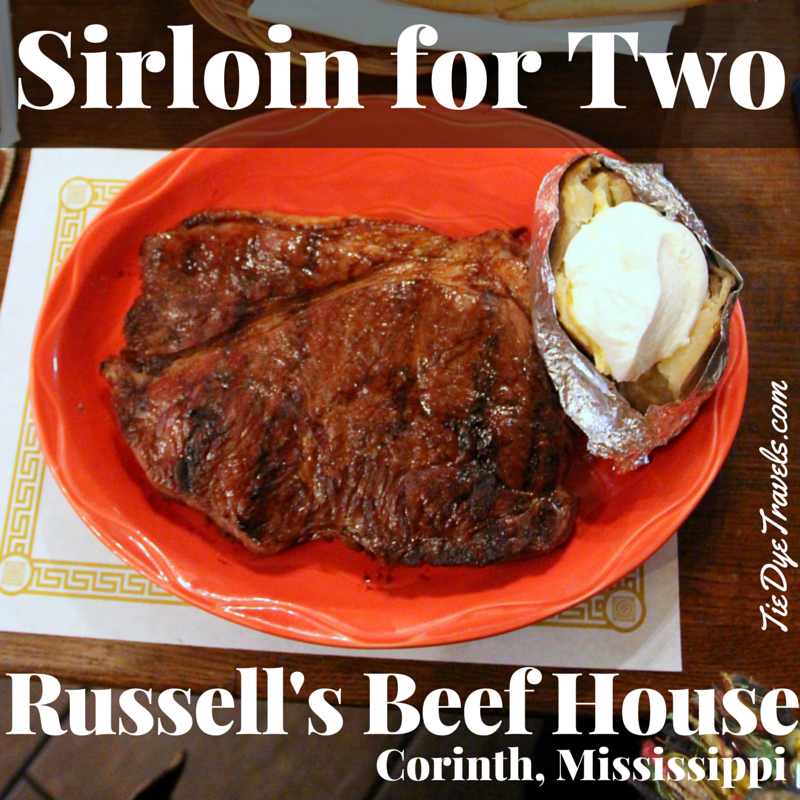 In fact, the sad fact that I don't have photos from any of those early visits is why Grav and I decided to divert our trip home from Birmingham to get us up to Corinth for one of these steaks. Mind you, Siri was plotting against us and tried to send us elsewhere about six times, which is why we saw way more of rural Alabama on the way there before we arrived (we'll be back, Russellville Alabama, you have interesting things) in our epic foggy, wet drive, but eventually we pulled into town and into the soggy parking lot. We were shocked to find that for once, there was not a line to get in. We were also thankful for that... as I mentioned, it was raining. 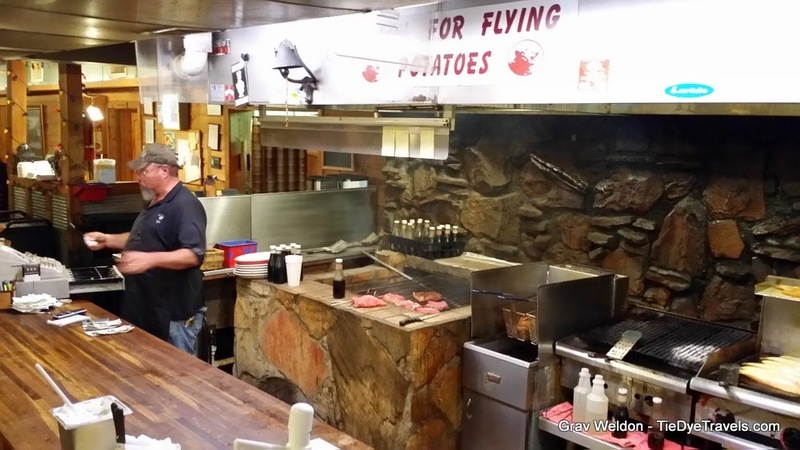 Inside, the scent of meat roasting over an open fire permeated everything -- from the all-wood walls to the all-wood tables to the not-all-wood wait and cook staff. 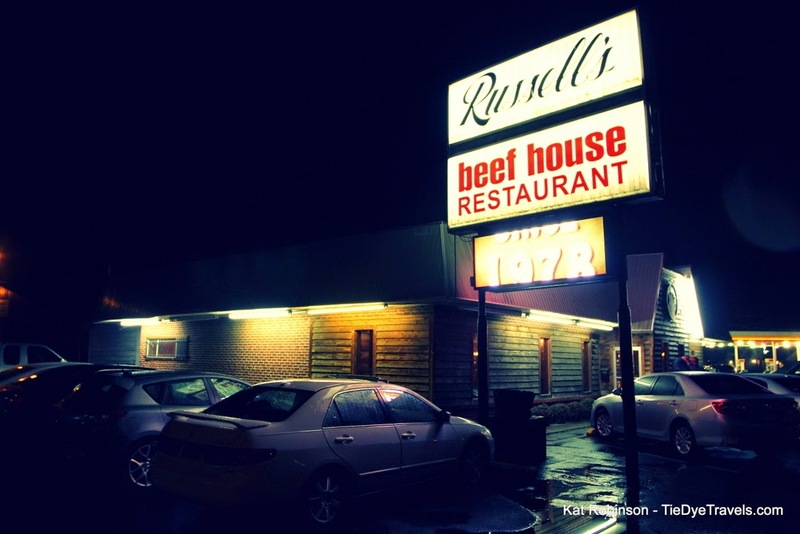 If you can't stand the smell of beef, you're just out of luck here. The effect is to immediately cause one to drool and possibly paw at the ground a bit. 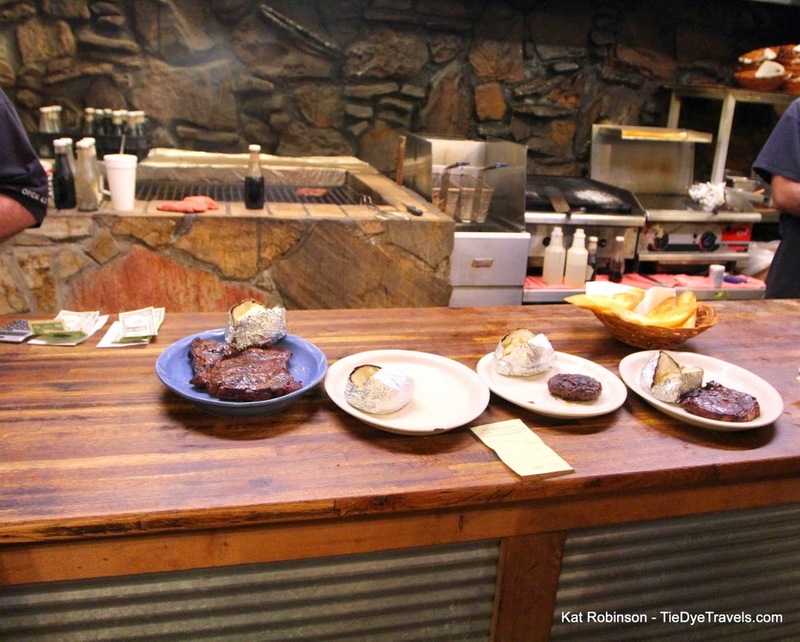 We were escorted to a table in the front section (the restaurant consists of a cavernous collection of wood-paneled rooms), right past the open grill, where meat was happily sizzling away under an expert eye. 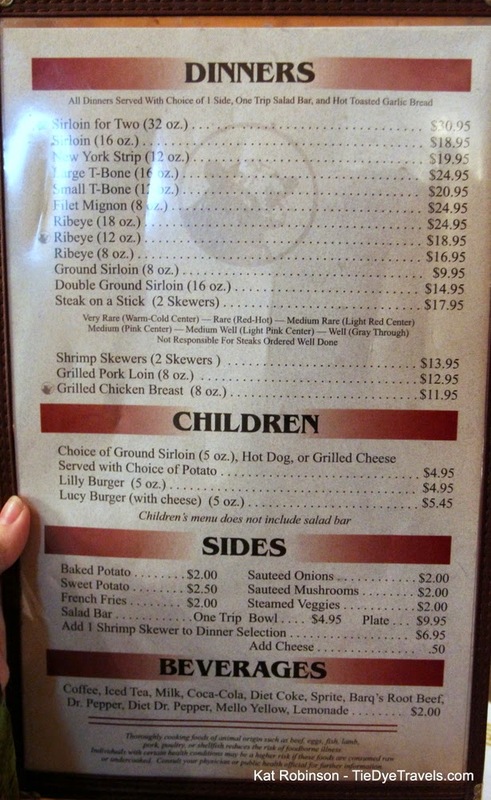 We didn't really even need to look at the menu. 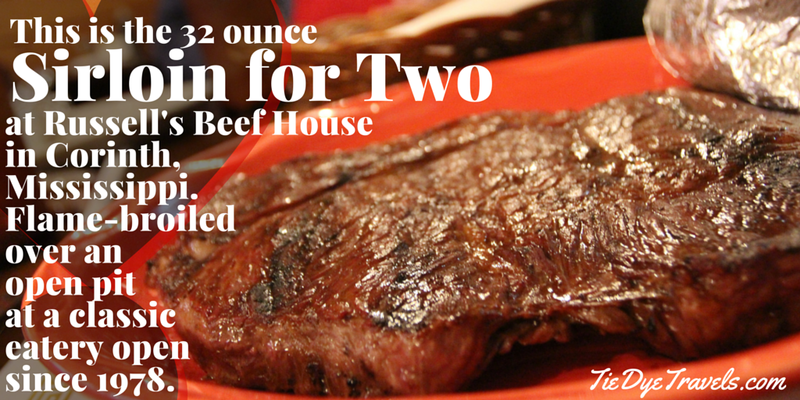 I knew what I wanted, and Grav acquiesced that yes, the Sirloin for Two was an excellent choice. 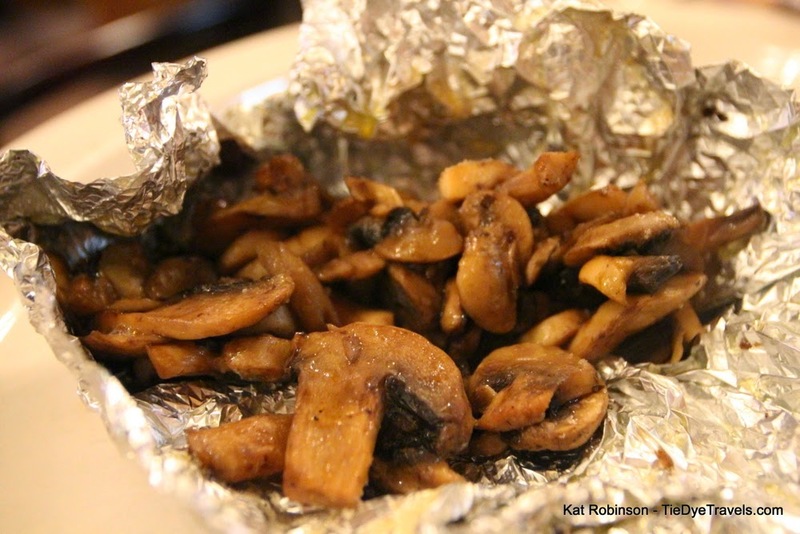 We ordered it medium rare-towards rare, I chose a baked potato as a side and he went for sauteed mushrooms. 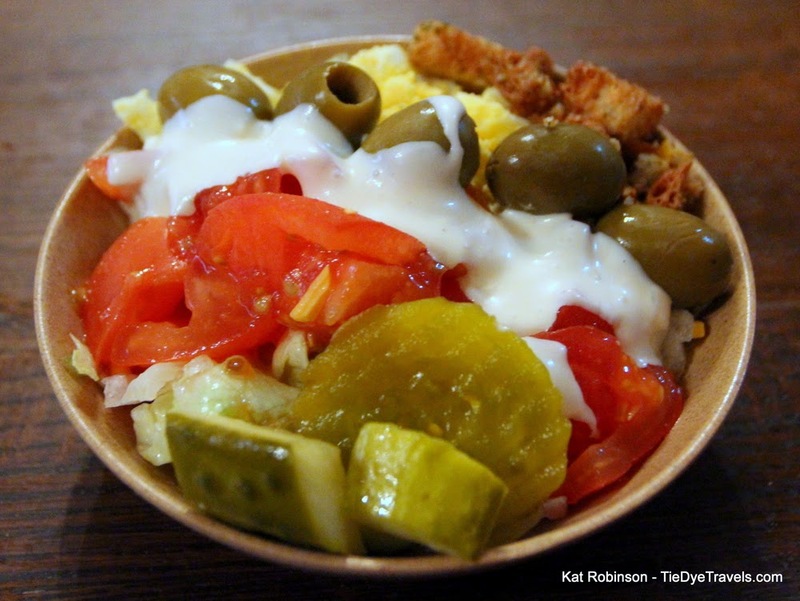 While our steaks were being prepared, we slid up to the salad bar and filled our bowls. 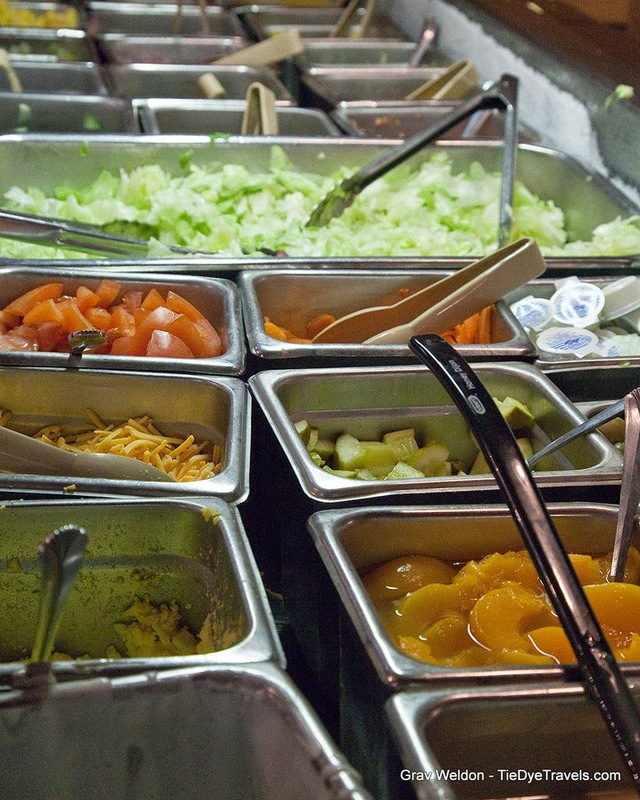 The salad bar isn't all that large at Russell's, but it's nicely packed with anything you really might want to consume before a steak. 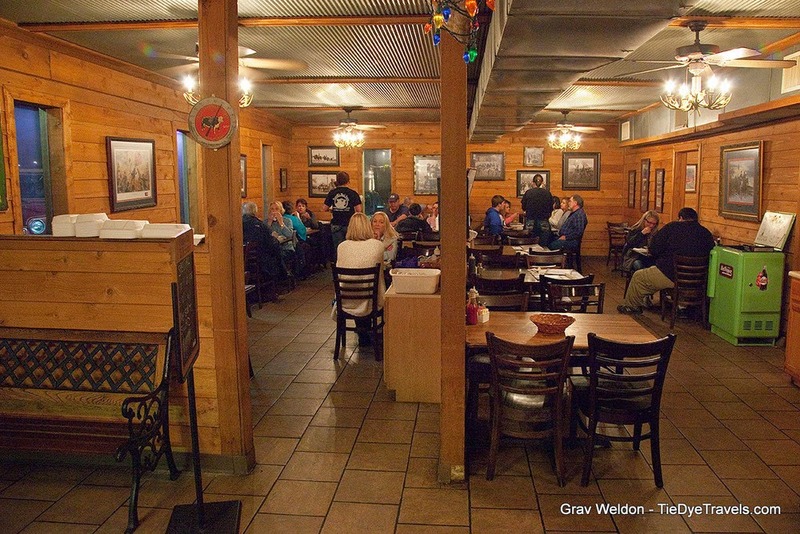 It's located right next to the front door, which means you really do see about all the restaurant has to offer at one time upon entry to the place. normally doesn't take that long to get from Birmingham to Corinth, but as I mentioned, we'd been sidetracked. restaurant. 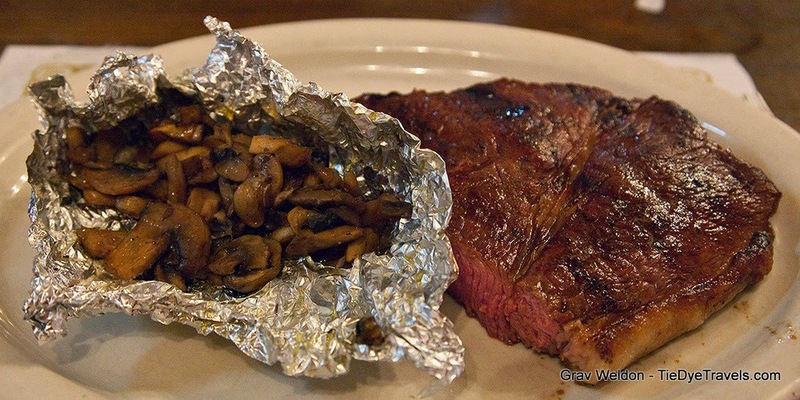 Baked potatoes are popped open and scoops of the two are slapped inside immediately after steaks hit the plates when they come off the grill, which pretty much allows the waitress to fling them on, pick up the plate and have it to the diner in mere moments from coming off the great pit. evening, so we didn't notice any potatoes actually flying, but I'd be interested in seeing this happen (I'm told that they'r called flying potatoes because they'll fly right into your stomach, which alleviates my concern over the potential for thrown potatoes ala the thrown rolls at Lambert's Cafe and its knockoffs). What did seem to be flying, though, were steaks when they were ordered. They were pulled from a designated refrigerator to the right and brought over quickly to be thrown onto the brick-and-stone grill in the middle of the cooking pit. There wasn't much evidence of any other cooking than this, but that was fine. Tendrils of smoke were steadily whisked up and out by a massive overhead fan. 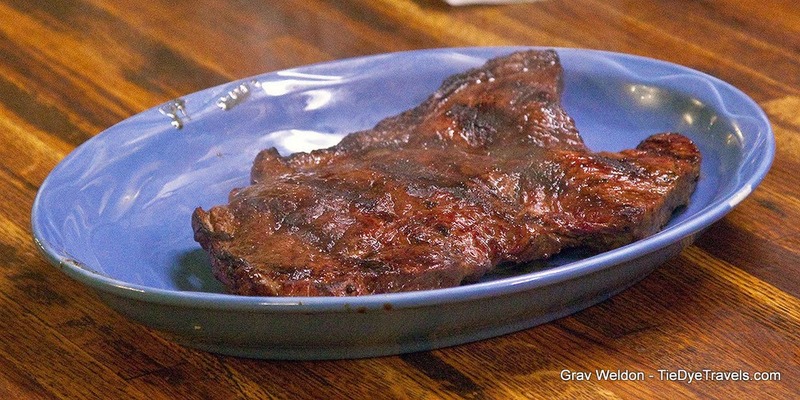 The grill master expertly doused each steak with the special house sauce and maneuvered them with great tongs from one side of the charcoal heat to the other. 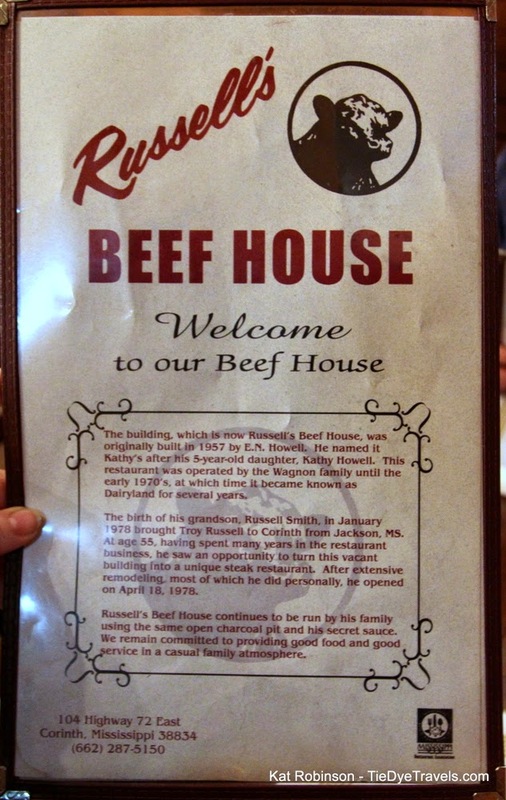 Russell's Beef House, by the way, is housed in a building built in 1957 by E. N. Howell, who ran a restaurant named after his daughter Kathy there. It's also been home to the Dairyland. 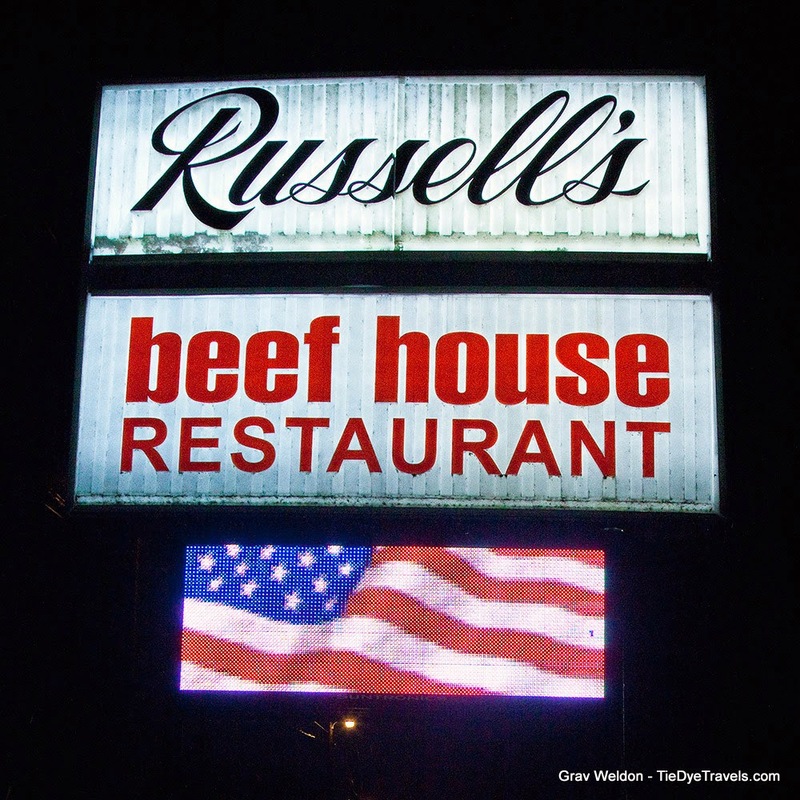 According to the restaurant's website, Troy Russell came back to Corinth when his grandson, Russell Smith, was born, and decided to open this great steakhouse. The young boy grew into a restaurateur himself. 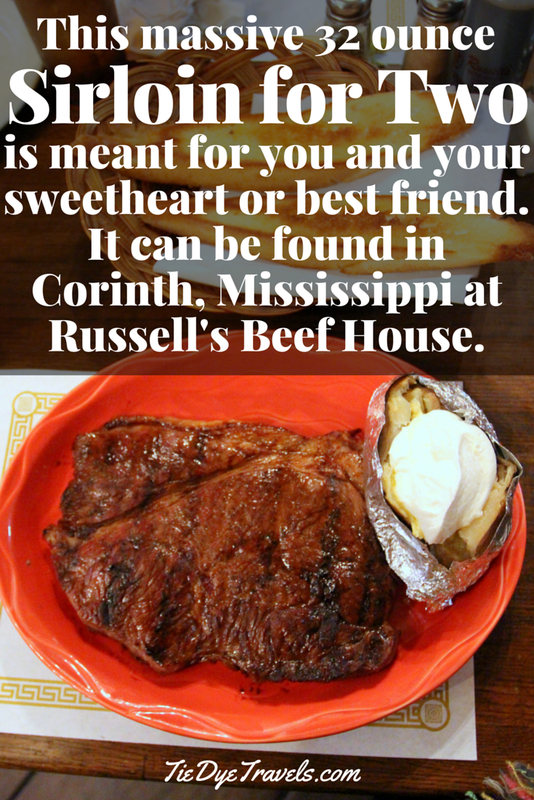 Russell Smith has not only worked at Russell's Beef House, he and his wife have another restaurant called Smith in downtown Corinth -- which I need to visit next time I come to town (along with Abe's Grill, I'm told). 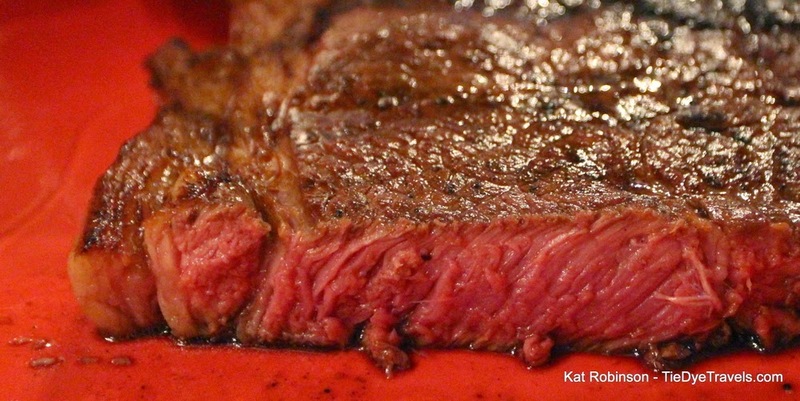 And this... this is a STEAK. An inch thick, over a foot wide, glistening and hot. Dang it, I wanted to eat it right then. the middle and still red, butterknife tender, minimal gristle. 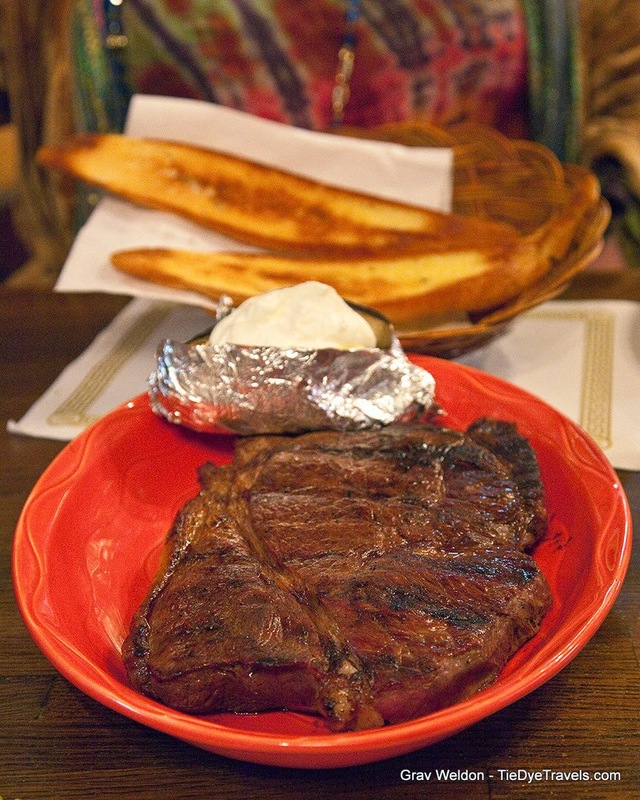 I interspersed bites of steak and potato, saving the salty bread spear for sopping up juices. We did learn something this time around. 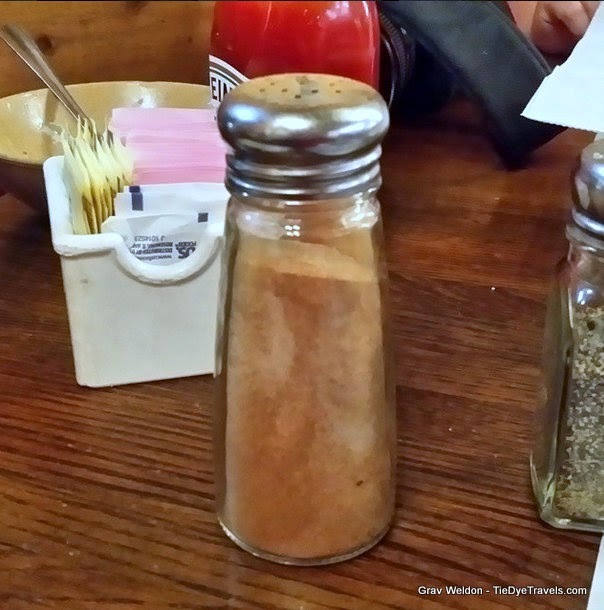 Grav wanted to try the house seasonings and went for a shaker bearing orangish-red granules within. The surprise came when he discovered this cinnamon-sugar mix was for baked sweet potatoes. Well, you live and learn. on us and see if we needed more tea. And yet, half the steak was still there. 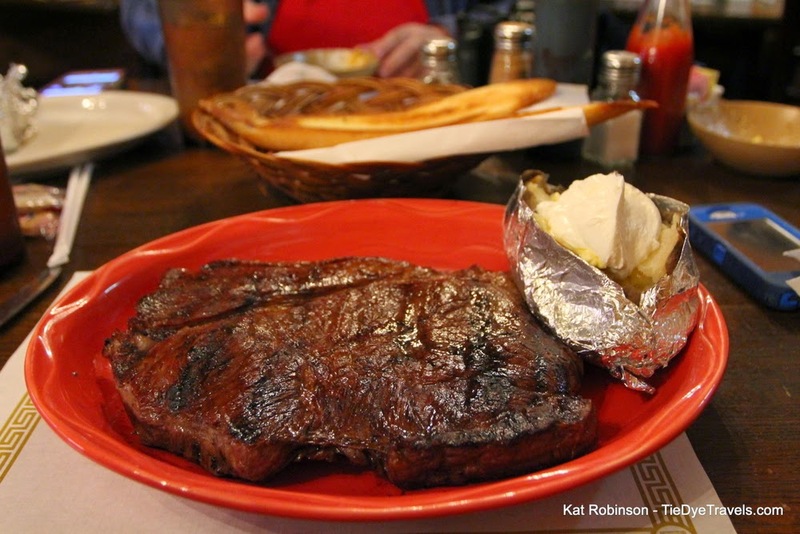 We're not complete gluttons -- that was a pound of meat for each of us! So of course, it went home with us. It wasn't easy to leave. Though we were cheerily brought our ticket and box, and though the jovial gentleman invited us back, and though the rain had briefly ceased, we found ourselves plopped into the car after shooting the sign outside wishing that Tupelo (our final destination for the night) were just a bit closer, since we were both ready to turn in for the night. We did manage to make it, smelling what was left of that steak the whole way.